Whether you find yourself suffering from a sore neck, aching back or joint pain, having a heating pad nearby to help sooth away the pain is always a good idea. We've looked at a variety of different heating pads here at ReviewLab to come up with a list of some of the best products currently available on the market. We've taken into consideration price, heating pad design, heat, cold and moist therapy, and more. Read more about our methodology. This multi-purpose pack can be used for either hot or cold therapy to sooth joint aches, muscle pains and promote relaxation. This reusable, eco-friendly, and pet safe heating pad by Nature Creation is our top pick for best overall heating pad. 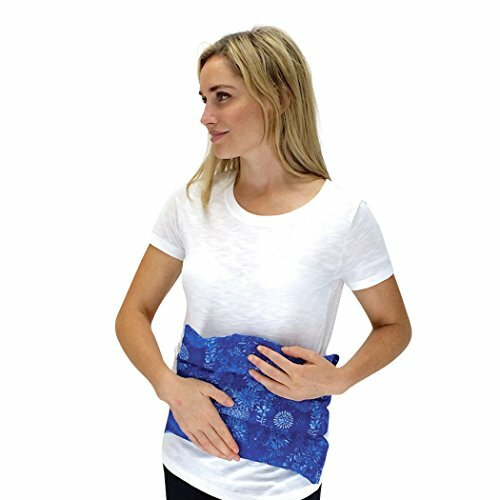 This multi-purpose heat wrap is the perfect solution to relieving muscle and joint pain, stress and promoting overall relaxation. Filled with lavender flowers and rice, this scented heating pad is our runner up for best overall heating pad. The Dual Cold and Hot Therapy Pack by Tempthera is our top choice for heating pad with best value. This reusable gel pad is ideal for all sorts of injuries, and can be used time and time again. 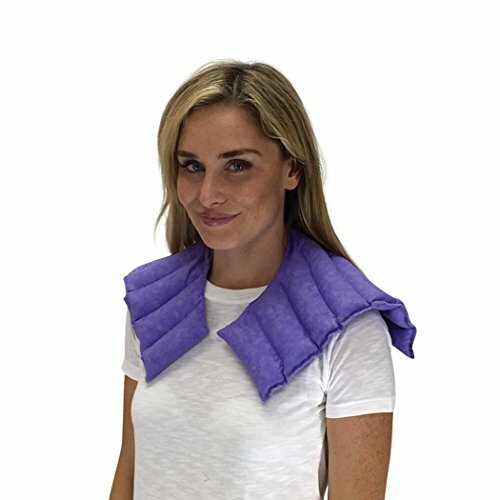 For those looking for a heating pad that perfectly fits around their neck and shoulder, this is the perfect product for you. Use this heating pad for either hot or cold therapy to relieve sore and aching muscles and joints. This eco-friendly and pet safe heating pad is our runner up for heating pad with best value. For consistent and controllable heating, an electric heating pad is the surest way of delivering heat therapy to any afflicted area on the body. The PureRelief XL Heating Pad is built with fast-heating technology and 6 different temperature settings for your comfort and relaxation. For those looking to sooth an aching and sore back, the Thermophore Classic Deep-Heat Therapy Pack can get the job done. This heating pad draws in moisture from the humidity in the surrounding air to provide deep-heat therapy to relax and stimulate back muscles to reduce spasms and strain. With an outer case made of 100% cotton, this heating pad by Caylee's Creations can be use for either hot or cold therapy. Hand-made with triple-stitched seams for increased durability, this heating pad is made with whole corn grains due to its high level of heat retention. The heating pad's internal contents are mildew resistant and the cotton case is machine washable for added convenience and maximum product life. When it comes to heating pads, there are two main types of heat therapy that can be used to help ease muscle tension and joint pain. Regular dry heat therapy helps to promote blood circulation and can ease muscle spasms. Moist heat therapy is known for its deep muscle penetration, which is typically used for such ailments like arthritis. There are also differences between microwave and electric heating pads that can make a significant difference when it comes to your needs. Not all heating pads are made the same. Some heating pads come in smaller, more flexible sizes, while others can be larger to cover more area. Heating pads can also be designed to target specific areas of the body, such as the neck, shoulders, back, and so on. If you're looking for a mutli-purpose heating pad, it's recommended that you look for a medium-sized rectangular or square heating pad to be used on multiple parts of the body. If you're hoping to target a specific part of the body, there are many options of the market for heating pads that are better suited for specific areas. Heating pads tend to be rather inexpensive. Depending on the size of the heating pad, and whether or not you opt for an electrical heating pad, most heating pads are below $25. Electrical heating pads tend to be on the higher end of the price range, anywhere from $50 and above. If you're hoping to target sore muscles, aching joints, arthritus, tendonitis, general stress and tension, the Lumbar Herbal Heating Pad by Nature Creation is the perfect choice for you. Measuring 12 x 8.5 x 1 inches, this lightweight heating pad can cover large areas for targeted heating or cooling therapy. 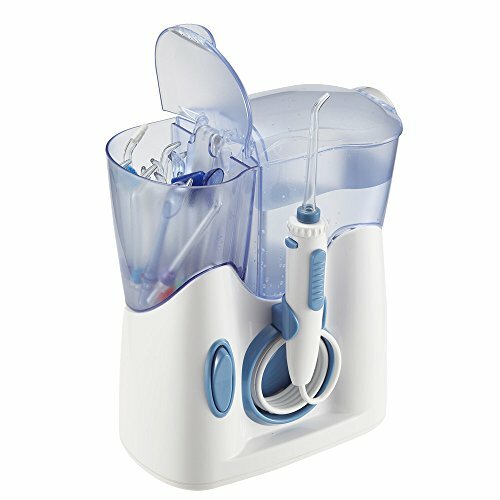 Can provide hot or cold therapy. Depending on your needs, you can either place this heating pad in the microwave to heat it up or you can place it in the freezer to make it a cooling pad. Product consumers note that it holds heat very well. Divided into three channels for even heating or cooling. The Lumbar Herbal Heating Pad by Nature Creation is designed with three individualized channels that help to evenly distribute heat or cold to the afflicted area. Due to its design, the pad can curve around any body part for maximum coverage. It's easy to clean. There's no need to wash this heating pad. Simply wipe the exterior fabric with a damp towel or wipes. Filled with aromatic herbs for relaxation. The Lumbar Herbal Heating Pad is filled with 10 different aromatic herbs that help to promote relaxation and relieves stress and tension. Aromatic herbs may be too strong for some users. Some product consumers note that the aromatic herbs are a cause of irritation. The scent can be a bit overbearing and become a cause of discomfort for some, especially those who cited allergies and nasal sensitivity. Too thick to lay on comfortably. While designed to retain heat better and distrubte heat evenly, the design has been described as slightly thick and bulky. Because of this, some product consumers make a mention that the pad is too thick to comfortably lay on. This heating wrap is 100% reusable and takes only a few minutes to heat up in the microwave. Due to it's length, you can easily wrap this pad around shoulders, around your back, or drape it along any areas of tension. 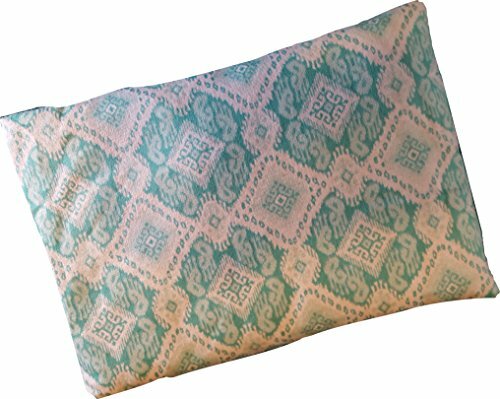 My Heating Pad - Multi Purpose Heat Wrap by Nature Creation is measures 25 x 5 x 1 inches and weighs only 2.3 pounds. Lavender scent helps promote relaxation. It's well known that lavender can help with muscle relaxation and reduction in tension and stress. This heating pad is filled with lavender flowers and rice that assists in heat therapy to further sooth the user. Size of pad is useful for different areas. Whether you've got neck pain, back pain, or any other sort of stress, this pad can easily be wrapped around for maximum coverage. You can easily drape the pad around the afflicted area and hold it in place with the attached handles. Three channel design for even heat distrubtion. The My Heating Pad is designed with three separate internal channels to help with even heating and distribution. This way, there are no cold spots to worry about and no need for immediate reheating. Can also be chilled for cold therapy. Alternating between hot and cold therapy can be incredibly effective for relaxing sore muscles and joints. If you're looking to have some cold therapy, simply place the My Heating Pad into the freezer for a cold pad. Many product users note how they love the versitility of the pad for either hot or cold therapy. Scent may be overwhelming to some users. Reviewers note that the heating pad has a very strong scent after initial use. They do note that the strength of the scent does fade, but it can be irritating to some users. 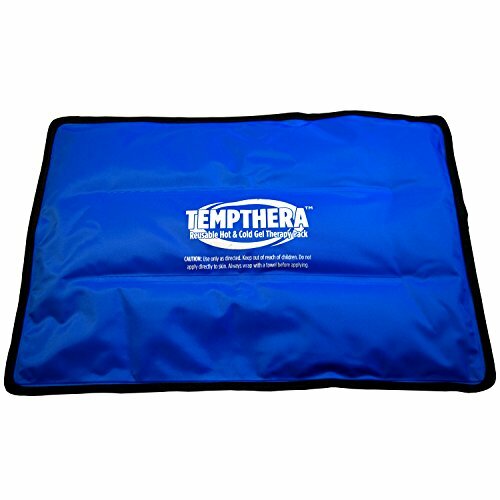 With three different sizes to choose from, this heating pad by Tempthera can be used for either hot or cold therapy. The pad's edges are made of polyester, which is both smooth and leak-resistant. This latex-free nylon pack is perfectly safe and can effectively deliver hot or cold therapy to any afflicted area. Extremely flexible design. This gel heating and cooling pad has a great degree of squashability, which means that it can easily conform around the shape of yoru body. Whether it be joints or flat muscles, this heating pad can provide heat where you need it. Plastic odor present for the first few uses. Consumers note that during the first few uses, this heating pad does give off a slight plastic odor. While it does fade over repeated use, it can be an irritant to those with sensitivity to smell. This heating pad by Nature Creation is ideal for use around the neck, shoulders, and hard to reach upper-back areas. Measuring 18.5 x 11 x 1.5 inches, this heating pad is filled with aromatic herbs to help promote relaxation. Designed specifically for the neck, shoulders and upper-back area. It can be difficult to find a heating pad that will comfortably wrap around these areas, but the Neck & Shoulder Wrap by Nature Creation can comfortable drape around the shoulders to provide much needed heat or cold therapy. 10 different aromatic herbs for relaxation. This heating pad comes filled with a wide range of aromatic herbs that are said to help induce muscle and mental relaxation. 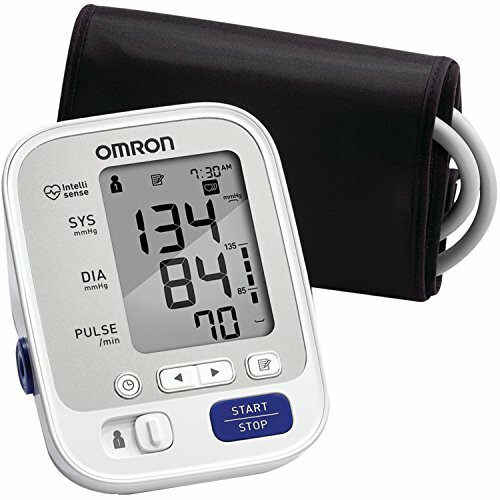 Can be used for heat or cold therapy. 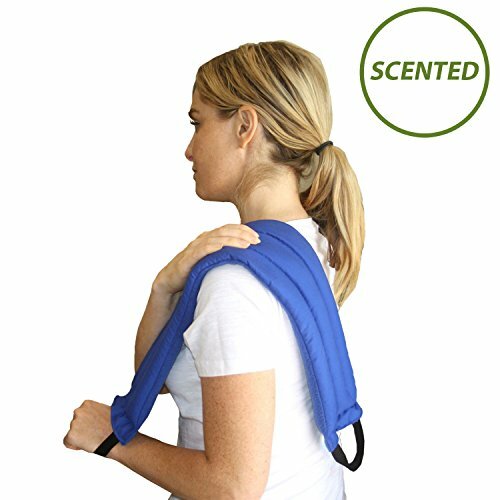 This versitile Neck & Shoulder Wrap can be heated up in the microwave or placed in the freezer to provide either hot or cold therapy. Easily alternate between the two temperatures to meet your needs. Not suitable for other areas of the body. Due to its design, this heating pad makes it more difficult to be applied to other areas of the body like the knees, ankles, and so on. Aromatic herbs may be too strong for some individuals. While product consumers notice that the scent fades over time to be less overbearing, some individuals may find that the aromatic herbs can be an irritant. It's recommended that you purchase a different version of this heating pad without the herbs if you're sensitive to strong scents. Electric heating pads typically plug into a power outlet and offer users a dry heat alternative. For those looking for consistent heat output and more control over their heating pad's temperatures, electric heating pads can easily meet those needs. Measuring 12 x 24 inches, this heating pad can cover large areas to treat sore muscles and aching joints. Made of incredibly soft microplush fibers, the PureRelief XL Heating Pad is safe for both moist and dry heat therapy and can heat up quickly due to its built-in fast heating technology. Incredibly soft machine washable material. The PureRelief XL Heating Pad is made of microfiber, which not only helps to insulate the heat, but feels extremely comfortable. The pad can be machine washed for easy clean up after use. Fast-heating technology and temperature controls. The PureRelieve XL Heating Pad comes with a digital LCD controller that adjusts heat levels to what you find most comfortable. With 6 different heat settings ranging from low, medium low, warm, medium, medium high, and high, easily adjust to what feels best for your needs. Can be used for dry or moist heat therapy. Wet therapy is known to have deeper heat penetration for those experiencing especially sore muscles or joints. 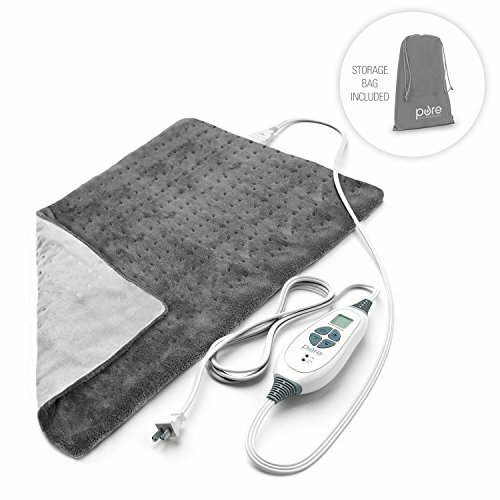 The PureRelieve XL Heating Pad can be used in moist heat therapy to directly target aching areas. Convenient 2-hour automatic shut off. This heating pad comes with an automatic shut off to save electricity, as well as ensure that damage to your muscles don't occur. The automatic shut off also prevents potential overheating and fires. Wiring and electrical cord can be felt through the pad. While the microfiber material of this heating pad is incredibly soft, some product consumers mention that they are able to occasionally feel the wiring and electrical cord when laying on it. In addition, the electrical control remote is very noticeable when underneath the pad. Heating pad doesn't get as hot as it could. Reviewers note that the heating pad doesn't get quite as hot as they would like. For those looking to find a heating pad that can easily target the hard-to-reach areas of the back, there are heating pads that are specifically designed for those areas. Here is a list of the best heating pads for back pain. 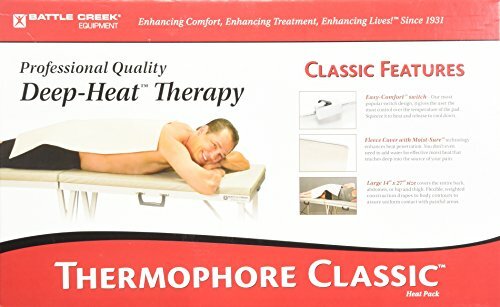 Measuring 14 x 27 inches, the Thermophore Classic Deep-Heat Therapy Pack can comfortable cover the majority of the back region to provide soothing and relaxing heat. You can also drape this heating pad over the abdomen, hip or thigh for contour-fitting moist heat therapy. Designed with an easy-comfort switch. The Thermophore Classic Deep-Heat Therapy Pack comes with a switch that provides complete control to its user. Simply hold down the switch to increase the amount of heat, and release to have the heating pad cool down. Fleece cover enhances heat penetration. This heating pad actually draws in moisture from the humidity in the air to provide deep-heat moist therapy to the afflicted areas. There's no need to add water to achieve moist therapy. Switch requires constant attention to maintain heat levels. With the way the heating pad's switch is designed, the switch must be held down to be "on." If you're looking for a heating pad that can work and regulate by itself, you may want to reconsider this particular heating pad. Some product consumers mentioned confusion about how the switch worked, and others did not want the added responsibility of monitoring the temperature levels. Moist therapy is an alternative to dry heat therapy. Moist heat draws in and uses humidity to help sooth areas of pain and tension. A heating pad that offers moist heat therapy is ideal for those looking for heat that is better able to penetrate into muscles and joints for faster comfort and relief. Caylee's Creations Corn Bags are reusable and long-lasting. This particular heating pad measures 11 x 7.5 x 2 inches and weighs about 3 pounds. Easily microwave for 2-3 minutes for a reliable heat pack or place in the freezer for a cold pack. This heating pad can help with muscle aches, cramps, headaches, arthritis and much more. Heat lasts for about half an hour. Many product users comment that this heating pad retains its heat very well, usually lasting for about 30 minutes. This is an ideal amount of time, as it provides enough heat for a long enough time to provide actual beneficial healing properties. Removable cotton cover for easy washing. The cover is made of 100% cotton and can be removed for a quick wash and dry. This helps to prolong the life of the heating pad. Corn grain makes for a stiffer pad. In comparison to a rice grain, the corn grain that makes up this heating pad results in a stiffer and thicker heating pad that some say is uncomfortable to lay upon. While ideal for such areas like the abdomen or back, the heating pad is difficult to wrap around joints and curved parts of the body.